Lana Del Rey on the cover of Elle UK magazine, June 2017. 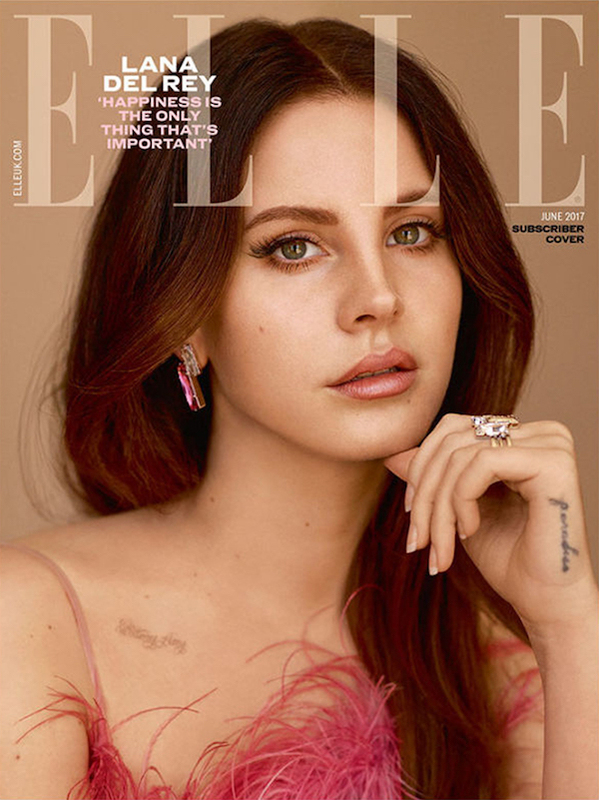 Lana Del Rey covers the June 2017 issue of Elle UK magazine, saying in the cover-story that, "Happiness is the ultimate life goal. I think it's the only thing that's important. There are no mechanisms in place for routes to happiness, that's the whole f**king problem." On love: "All the tough things that I have been through – that I've drawn upon [in my work] – don't exist for me anymore. Not all my romantic relationships were bad, but some of them challenged me in a way that I didn't want to be challenged and I am happy I don't have to do that now." "For me, the dream is to have a little bit of edge, the sexiness, the magnetism, the camaraderie, be on the same page and all that stuff, but without the fallout that comes from a person who is really selfish and puts only their needs first, which is like a lot of frontmen if we're talking about musicians!" "I’m going to write a book one day called, 'The curse of the frontman and why you should always date a bassist'." MusicLana Del Rey on the cover of L'Officiel USA, February 2018. MusicListen: The Weeknd feat. Lana Del Rey - 'Prisoner'.